The ArabLit Quarterly makes a November debut. 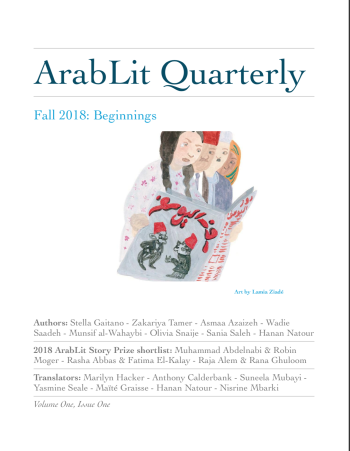 The ArabLit Quarterly officially made its debut on November 15, 2018. The newest publication in town is the work of award winning publication ArabLit.org. ArabLit.org, founded and editor-in-chief M Lynx Qualey, is one of the best resources out there if you want to know what is happening in Arabic translation. Apart from curating what is happening in the world of writing in Arab translation, the collective also has other initiatives like the Bulaq Podcast and the ArabLit Short Story Prize. The winner of the prize this year was Egyptian writer Mohammad Abdelnabi for his short story Our Story translated by Roger Moger. The newest initiative from the team is the ArabLit Quarterly which made its debut on November 15, 2018. The new quarterly includes fiction by Sania Saleh, Stella Gaitano, Asmaa Azaizeh, Zakaria Tamer, Sofia Samatar, Raja Alem, Rasha Abbas, and Muhammad Abdelnabi. There is also poetry by Wadie Saadeh and Munsif al-Wahaybi. There are also interviews and opinions like Olivia Snaije talking to graphic novelist Zeina Abirached, Layla Azmi Goushey on Abdul Rahman Munif, and Hanan Natour talking to Munsif al-Wahaybi. For more of the best of writing from the Arab world you can go here for more information. Buying the publication is important because it ensures that contributors to ArabLit Quarterly, ArabLit, and Bulaq are paid. Money for writers and other content creators is something we can all agree on. Previous Previous post: Leyla Hussein is Women’s Prize for Fiction 2019 judge. Next Next post: Koleka Putuma poetry collection “Collective Amnesia” now in Spanish.